When shopping for commercial heating service, Danvers business owners come to United Service Co. first. As a family owned company with more than 100 years of combined experience, we have the ideal blend of small-town care and big-company capabilities. People come to us when they want personable technicians and service with a smile. They also come to us when they need cutting-edge tools and extremely knowledgeable heating and cooling professionals. We are truly a one-stop shop for all types of commercial appliance needs. Get to know us! When your commercial heating system breaks down, you schedule services. But what if we told you that you could prevent breakdowns altogether with one simple solution? We highly recommend preventative maintenance to every local business and industrial facility for this purpose. Commercial HVAC systems are complex, with tons of moving parts working together to achieve ideal temperature control. Keeping these components in proper working order requires a bit of handholding, in the form of professional maintenance. Explore this service. Heating unit inspection. We conduct a free inspection of your heating and cooling system, checking for wear and tear on parts. We can detect potential problems and conduct minor repairs to help prevent breakdowns. We always give free estimates before performing any repairs. Energy efficiency check. Small things such as motor lubrication and filter replacement can significantly improve the efficiency of your commercial heating system. If you’ve recently noticed higher utility bills than what is usual in winter, maintenance can help you conserve energy. Part replacement. Sometimes heating units need small parts replaced for optimal effectiveness. We keep our trucks fully stocked with equipment from many major brands to facilitate fast, same-day repairs. If we recommend replacement, it’s because we believe it will be a better investment than paying for repairs or because repairs aren’t possible. Entire system cleaning. Commercial heating service in Danvers must include professional cleaning. Your HVAC system deals with a lot of air and moving parts, so it’s easy to fill up with dust and dirt. We’ll replace dirty filters and clean air ducts to make your system cleaner, safer, and more efficient. Breakdown prevention. During our inspection, we may notice signs that your system is about to break down. This might be due to a part that’s ready to break, or it might simply be time to replace an old heating unit. United Service Co. sells and installs new HVAC systems for commercial and industrial use. Preventative maintenance can work wonders for the performance of your system. It’s one commercial heating service in Danvers we recommend to virtually every business. Without regular maintenance, you put yourself at risk of a breakdown on the coldest day of winter – leading to repairs that are more expensive than maintenance might have been. United Service Co. can easily schedule you for preventative maintenance when you contact us. One call does it all. An important commercial heating service in Danvers is HVAC repair. No matter how well you maintain your system, it will eventually need repairs. It is simply the nature of the technology. Maintenance keeps repairs to a minimum, but you will eventually require the services of a professional heating technician. United Service Co. has satisfied the needs of thousands of business owners since our foundation in 1953. Convenient scheduling. We know your life is busy. We want to make commercial heating service in Danvers as convenient as possible for businesses. We work around your schedule to plan HVAC repairs and preventative maintenance. Quick response to calls. We won’t avoid your call on a busy day or make you wait until it’s convenient for us to come out. We understand the importance of your HVAC system to the health and comfort of your facility. Our services are always prompt and professional. Customized solutions. While our technicians understand the patterns and repairs for select systems, we also realize that customers sometimes need tailored solutions. We’ll work with you to come up with the ideal system for your needs, goals, and desires. Our custom-designed walk in coolers are a great example of this promise. One-stop shop for services. 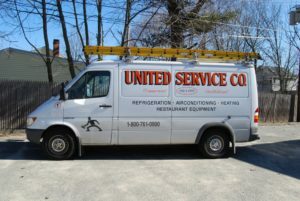 United Service Co. does much more than commercial heating service in Danvers. We are a full-service company that skillfully handles a wide range of refrigeration, heating, and cooling needs, both commercial and residential. 100% satisfaction guarantee. We are committed to total customer satisfaction. If there is anything more we can do for you during a service call, please let us know. We go above and beyond to benefit our customers. The secret to our success is the incredible value in each repair we perform. We use only the highest quality parts and materials, and we do our jobs with a foundation in craftsmanship. We are dedicated to customer satisfaction – a mission that shines through in our glowing testimonials. Read them for yourself. We are completely confident you’ll want to use United Service Co. again and again after your very first commercial heating service in Danvers. Ready for Your Commercial Heating Service in Danvers? Schedule preventative maintenance before the first sign of something being wrong with your HVAC system. If something has already broken down, don’t panic. Our technicians can be on-site in a matter of hours on most days. We’ll quickly troubleshoot your problem, recommend repairs, and do what needs to be done to get your system up and running like new. With United Service Co. in your corner, you’ll never stress about the performance of your commercial heating again. To learn more about commercial heating service in Danvers, give our team a call. We’re happy to talk about your system with you. We’ll recommend ways to boost your energy efficiency, heat output, and overall facility comfort – all on your budget. We are the local authority when it comes to commercial heating, cooling, ventilation, and refrigeration systems. See what all the fuss is about – call (800) 761-0900 to schedule your commercial heating service. Danvers residents will never go to another HVAC company again.